Official Raspberry Pi power supply for Model B+. 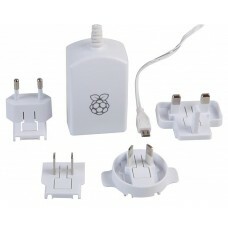 This power supply comes with 1.5m Micro USB lead, four changeable heads for UK, EUR, AUS & US regions. Supports up to 2A of current whcih is plenty to power hungry power devices through the four USB port son the Model B+ Raspberry Pi. This unit is level V energy efficiency compliant and meets the latest EuP and CEC legislation.